J.D., one of the botanists from my PR days with the Gulf Coast Research Laboratory, suggested that the photos I emailed him looked like Phyllanthus urinaria, common name chamber bitter. Thanks, J.D. 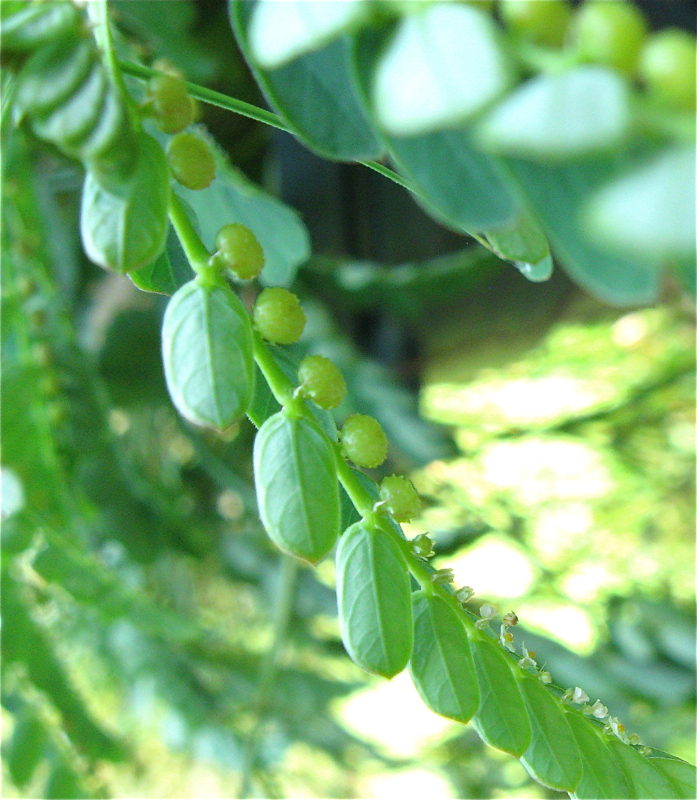 The plant, reaching around 2 feet, has small alternate leaves resembling those of the mimosa tree. When touched, the leaves fold in automatically. A photo that accompanies the Wikipedia entry here boasts reddish fruit that I have not seen before, but then this is the first season I have ever seen the plants get this big and so extensive. I guess my post-stroke mulching discouraged them in the summers of 2011 and 2012. The characteristic of how the leaves fold up when touched is probably why I retain a vivid memory of my mother's showing me the plant when I was little. I still cannot remember exactly what she called it, but it was something like "sleepy weed." Of course, when I googled "sleepy weed," only citations related to marijuana came up. I don't want that weed in the family vegetable patch, either! How cool that you finally found out!! I have actually never heard of this, even with all it's names.. NOW I need to be on the lookout for it! Oh how funny. No, I wouldn't want either weed in my garden either. True story: Marijuana is legal in Colorado. An acquaintance recently suggested I try it for sleep problems. This person swears by it. I will pass on that suggestion! I posted a photo of a shrub with red flowers growing in my back yard and just yesterday received an email from a reader who identified it. Well none of the common names suggest it is the least bit edible. Thanks for the update. I was curious and now I know to get rid of it when I see it.